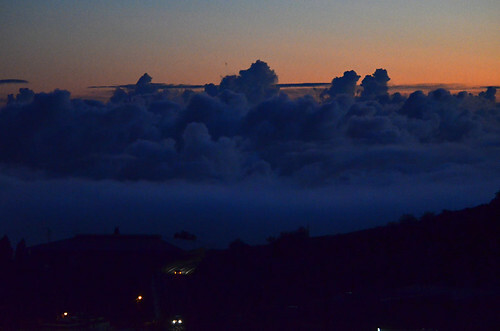 We spent the night in another part of the island, sitting on a hillside watching a fiery sunset from above the clouds. At one point, below us a plane emerged from the blue bank of fluffy but threatening clouds at the same time and nearly the same place as a car’s headlights. At least from our position it looked as though it was nearly the same place. Curious. Above us the sky dazzled with constellations. This morning someone had painted it a dull grey. Drizzle and low mist accompanied us on the drive home through the mountains. We sprinted through watery bullets to the sanctuary of the house… and discovered the electricity was off, the main switch tripped. Heavy rain was the culprit. Whilst we enjoyed ourselves above the clouds, their contents had been making mischief. I flicked the switch and it jumped back to its mutinous non-working position. I tried again and it immediately flicked off again. The electricity company had recently installed a new meter on the road about 100 metres away. Don’t ask me why our electricity meter should be there, it just is. ‘Improvements’ here can often result in the opposite, so the first thing I did was to check it hadn’t malfunctioned. It hadn’t. The second suspect was a socket under the avocado tree in the garden. It’s been a problem in the past. If not positioned properly, rainwater seeps in and trips the electricity. On my way to the suspect tree I met my neighbours talking to an unfamiliar man who seemed to know a lot about electricity (I don’t). He advised me to carry out an elimination process, switching certain areas on and off and trying the main switch to identify where the problem was. It seemed a sound and simple idea. A couple of clicks later and the avocado tree was found guilty as suspected. The electricity is back on, and so is the rain. In the garden, a plug socket underneath an avocado tree sits encased in a plastic bag under the protection of the bottom part of an eight litre plastic water bottle. This primitive contraption will determine whether we will have light tonight. In three kilometres they haven’t paused to catch breath. Words gush out, creating sentences that never, ever end. I should be writing things like ‘tranquil terraces’ ‘silent apart from the kestrel’s shriek’ etc. etc. etc. The truth is there is no silence. There would be if the girls weren’t sharing the same path. But they are and so is their incessant chatter. We started the route at the same time and our paths have criss-crossed a few times. They’re much younger and faster. But every time they get to the point where the loud chatter becomes almost a whisper, they stop. Hair is put back in place, something is applied to the face, a bra strap is adjusted. They stop. I catch up and pass them… and the whole circle begins again and I mutter under my breath about the fact they won’t shut up and let me enjoy the peace of the countryside. I descend to the floor of a narrow ravine as they begin the climb out the other side. Sound is amplified. The cling-clang from the bells around the necks of a handful of goats pulling at wild herbs take on the intensity of the pealing inside a church tower. The echoing canyon prompts them to make howling noises. Nature winces. Even the goats pause their feeding to glare at these noisy creatures with no respect for tranquillity. I pass them again and start a climb that is taxing enough to bring the sweat sprinting down my face. After a couple of hundred metres I stop to rest on a rock. The girls catch up. “Un poquito descanso,” I say as they skip past. The have open, friendly faces with eyes as big as their smiles. 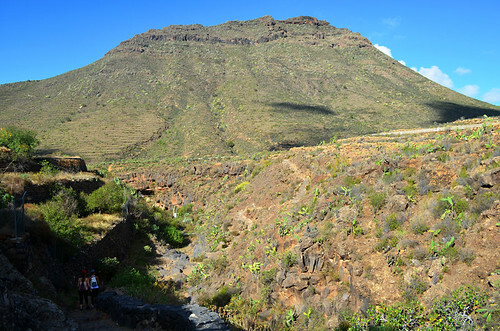 I reach the summit, a wide plateau with views across an arid land pockmarked by volcanic cones. The girls disappear into the shade of a rare tree, still talking. I sit on a flat rock nearby. Their chatter no longer annoys. In a way it has become a comforting drone. Part of the scene. After thirty minutes the girls emerge. They’re no longer talking. Now they’re singing… and dancing. They sing jauntily as they pass. I laugh. So do they, without missing a beat. The sun is engulfed by a bruised, heavy cloud. Rain is coming. Time to leave. The girls are a few yards ahead on the path. They’ve returned to talking in paragraph-less sentences. They’re enjoying themselves. They’re enjoying the land in their own way. It shows in their smiling faces and the musical tone of their voices. The scenery is stunning with or without a soundtrack and the girls’ happiness is infectious. I’m pleased I’m sharing the path with them. The car in front of me is crawling along at a snail’s pace; a particularly slow snail. The driver is an elderly man wearing glasses who is more interested in what is happening out of the side windows of his car than what’s happening in front. Lots of cars here have small dents. It doesn’t take a genius to see why. Concentration is not a strong point. I carried out a small experiment once, working out that it took, on average, five seconds before there was any movement when traffic lights changed from red to green. They don’t do things quickly. In this town it is difficult to get out of second gear. That’s not because of traffic congestion or anything. The road in front of the car in front can be empty and the snail’s pace stays the same. These old guys are just not in a hurry to get anywhere. You especially know you’re not going anywhere quickly when the car in front of you is an old Merc or a Berlingo. The drivers of these are the slowest of the slow. If they’ve got a chunky cigar clamped between their teeth then even second gear seems a speedy fantasy. It drives me crazy when I need to be somewhere fast. But in truth it’s quite endearing; I’d rather live in a place where people drive too slow than too fast. That won’t stop me shouting ‘why don’t you stick to riding a donkey’ next time I’m behind a tootling cigar chomper in a Merc though.